An example of aMICO project is where it receivesa phone call and presents the caller with a voice prompt: “press 1 for lights on”. MICO can then decode the caller’s button press and take action, in this case turn an output on. Of course everything is customizable: MICO has a microSD card slot so you can store your own voice and all MICO libraries and sketches are open source, free to download and hack. Simple:no need to learn complicated AT commands. Phone is controlled just with Answer/End Call Button and voice out of the microSD card. Perfect for quick/temporary projects:no need to buy GSM card just to run a quick demo project. Just plug in your own/friend’s phone. No need to tear it open to grab the card, or hack its software. Make MICO call to report temperature. On your own voice! MICO is an acronym for Mobile Interactive Voice Response & COntrol. The word mico in Portuguese and Spanish means small monkey. It's pronounced "mee co". 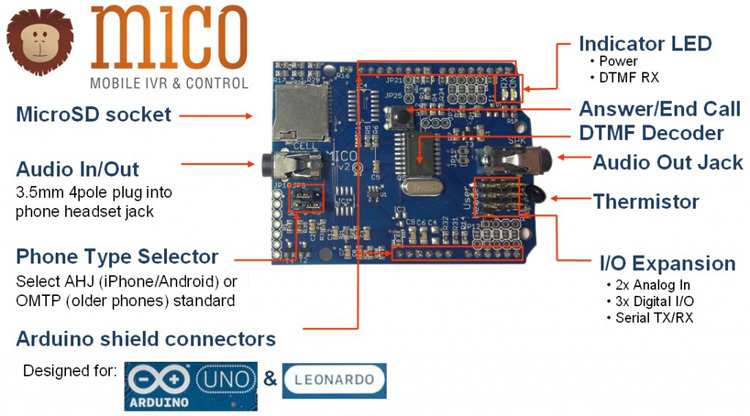 For more info and to get started with your MICO Shield, visit HelloMICO.com. If you encounter any problems when using this product, here is where you can get technical support.